This is a collection of each letter board saying I put together for the month. AINT NUTHIN BUT A PLANT THANG! My houseplants and I live in Long Beach, so this (sliiightly altered) Snoop quote seemed appropriate. Houseplants in this photo: Variegated Peace Lily, Camellia, Chinese Aralia, Pink Polka Dot Plant, Satin Pothos, English Ivy, Sweet Potato, Peperomia, and Tomato! 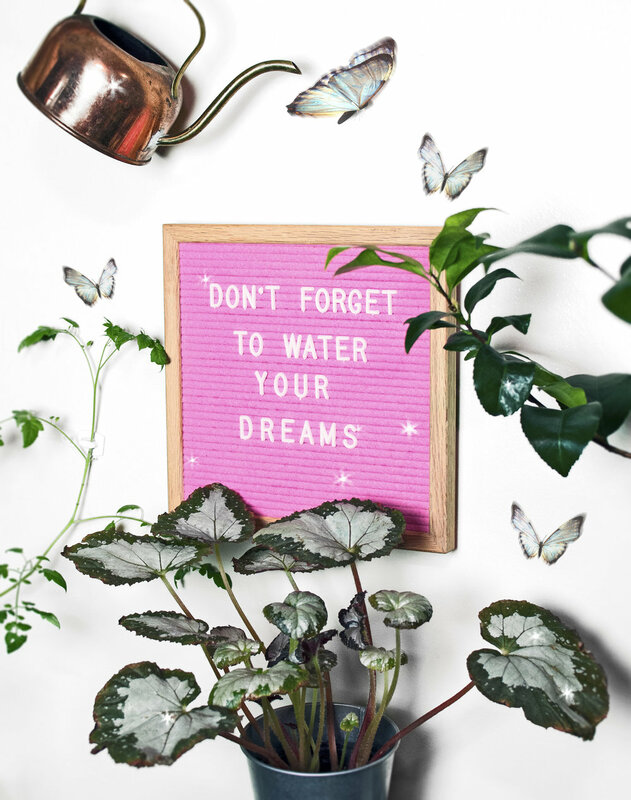 DON’T FORGET TO WATER YOUR DREAMS! Just don’t…overwater. Did you know the leading cause of houseplant death is by over-watering? Overwatering is usually a combination of too much water, and too little light. Another factor to consider is the soil, and whether it retains moisture longer or drains quicker. For most of my houseplants, I wait until the soil becomes dry (or just about to become dry) before I water again. There are certain plants however, that cannot tolerate completely dry soil, so find out what kind of environment your plant thrives in naturally and try to replicate those conditions! Plants pictured: Tomato, Rex Begonia, Japanese Camellia. WE CAN DANCE, WE CAN DANCE, EVERYBODY LOOK AT YOUR PLANTS! It’s not easy for me to make small talk, or just generally be social with people I’m not very familiar with… but PLANTS, now that’s a conversation topic I can get excited about! Can anyone else relate? For weekly letter board updates, follow me on Instagram!